Scottish Mile and cross-country champion with the English Mile and cross-country champion. I first met Aileen Lusk in the late 70’s early 80’s when I took my daughter training with Strathkelvin Ladies AC which was run by Molly Wilmoth and Aileen. The atmosphere at the club was great and all the girls had a wonderful time. 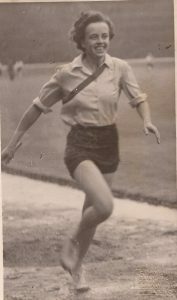 At that point Ailen was still very fit as you can see from the picture of her running with Dale Greig in the IGAL marathon in 1976 (below). I did not realise at this point just how good she had been although she did look look every inch a class athlete even then as a veteran athlete, twenty years after her triumphs in the 1950’s and 60’s. 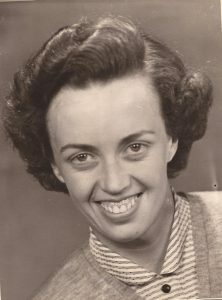 The profile that follows begins in 1952/53 when she came into the sport and immediately before her three-in-a-row national cross-country titles. In a series of newspaper articles, dealing with Scottish Women athletes, George Martin wrote the following. How many champions are lost to athletics for want of a little advice … a little encouragement … or a little enterprise? An American authprity has calculated that there must be literally hundreds of four-minute milers in the United States whose talent will never be discovered. Aileen Drummond is an example of ‘one who nearly got away’. Last year at 24 she was a slim, strong girl who played some tennis, badminton and hockey. She had run in the relay teams in her schooldays at Hillhead and Glasgow High School. She still ran occasionally – for buses. She was the best woman miler in Scotland: only she didn’t know it. 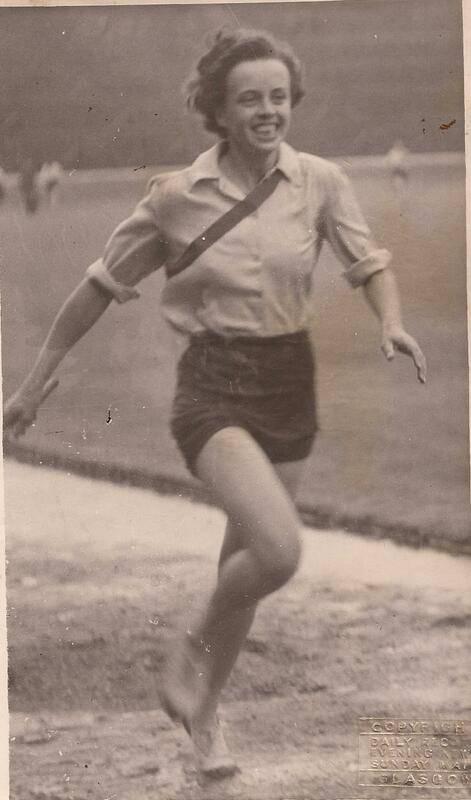 But one summer evening, as Aileen strolled out from her home inKelvindale, she caught sight of some girls training at the ‘Dough School’ sports ground off Great Western Road, gave her a hankering for the track game again. She made some timorous enquiries about joining Maryhill Harriers. They grabbed her. There wasn’t much of a champion’s look about Aileen in her first few track appearances. A second place in the Milngavie sprint was her only prize before the summer season ended. But what a different story in winter. Maryhill’s women ran two or three cross-country packs – fast, slow and don’t know. Soon they had another, Aileen Drummond was in a class of her own. She strolled off with the club’s cross-country championship over about one and a half miles. In the Scottish title race over roughly the same distance, Aileen turned out and, weakened by a bout of the ‘flu, and gained a gallant fourth place. Aileen was fit again for the track season – despite the protests of the rest of the Drummond family at the bumps and thumps from an upstairs bedroom every night. That was Aileen exercising. When her club championships came around, in went Aileen’s name for the quarter-mile, half-mile and mile. By the end of a busy evening she was champion for all three – incidentally knocking large lumps from the Scottish mile record of 6 mins 21 secs by getting under 6 mins. The Scottish mile championship was only her second race at the distance and down came the national record to 5 mins 35 secs. And then on to the White City and British Championships. It was the first time that Aileen had ever been in London and she was ‘terrified’ at all the ballyhoo of the big meeting. In the actual race she had something to be terrified about. Enid Harding who has run fastest women’s half-mile in the world – although there’s no official world record – put up a mile performance on that blistering day that would have done credit to many a man. Her time was a world best of 5 min 09.8 sec. In that kind of company for the first time, Aileen ran splendidly for fifth place. Time: 5 min 20.2 sec. The Drummond family, incidentally, were pleased as Punch – especially Dad – he had paid Aileen’s expenses for the trip. Now Aileen is back at her insurance office, keeping fit and looking around for competition. Any takers? You never know what you can do untl you try. Ask Aileen Drummond! With the cross-country season out of the way, Aileen ran in the West trials for the East v West match and won the 880 yards and the mile in2:40.5 and 5:52.9, but the reports explained the slow times by saying there was a strong west wind. Aileen also won the half-mile at the Vale of Leven Sports where her running off the virtual scratch mark 0f 5 yards was commented on. Her winning time was 2:29.4. If that was good, the SAAA Championships was even better – a double title succes at 880 yards and the mile. In the former she won in 2:25.4 from RWA Moffatt (Athenians) and Molly Ferguson (Springburn). In the mile, it was a win in 5:40 from M Wadler (Athenians) and M Campbell (Maryhill). Emboldened by this, she travelled with several other women to the AAA’s championships at the White City and did much better than the year before by finishing third in the Final. While she was there, she noticed that the British Insurance Companies Championships were being held that week so she entered the 440 yards – and won it! It had been a very good year indeed for Aileen: Scottish champion over the country, double track champion, and a medal at the British championships as well. Ayr race course was acclaimed the perfect venue for the Scottish women’s cross-country championships by both sepctators and competitors on Saturday afternoon when the race was run in glorious sunshine. With three circuits of approximately three quarters of a mile each to be covered by the runners, the spectators had a full view of the race from start to finish. As anticipated Aileen Drummond (Maryhill Harriers), holder, easily maintained her titlewinning with a comfortable lead of 70 yards from her club-mate Cathie Boyle in 18 min 29 sec. Cathie, who is only 15 years of age, ran a beautifully judged race and has the makings of a good athlete. The first six will represent Scotland in the international cross-country championship which will be held over the same course at Ayr Racecourse on March 26th.” The ‘Scots Athlete’ reported on the race in more depth. This event was omnce again favoured with fine weather although there was a cold east wind. Excellent arrangements were made by Mr and Mrs Thursby and Ayr Athletic Club and many members of the West District of the SCCU. Before the race there was quite a bit of speculation as to whether Miss Miller from Aldershot would master the reigning champion, Miss A Drummond, who was the home favourite, but the expected battle did not materialise as Miss Miller unfortunately did not finish the course. The course was one of three laps diagonally across the racecourse and this gave the spectators a good view of the entire two and a quarter mile race, but unfortunately the race was not well supported by spectators, the large East contingent of 1953 being absent. It was unfortunate that there were very few compettors from the East. Of a total entry of 23, including three teams, 20 faced the starter, and for the first quarter of a mile a small group including Drummond, Boyes, Miller, Ferguson, Elder and McLeod broke away and were still bunched at the end of the lap. Going uphill for the second time, Aileen Drummond started to force the pace which I though was not very fast at that point. But I had the feeling that the runners were suffering from an insufficient warm-up, and the cold wind which was affecting their breathing. They were certainly looking none too happy at that stage. As Aileen drew away trailing Miss Boyes and Miller after her, with the rest of the field strung out behind, it became apparent that the latter was in trouble, and that the youngest competitor was going to be a force to be reckoned with at the finish as she was moving easily and showed little signs of tiring. As the second lap was completed Drummond was about 30 yards clear up on the field and moving much better, Miller dropped out here and Boyes took up the role of challenger with McLeod maintaining her position close behind. It was now pretty definite that the holder would, unless something very unexpected happened, win again. This was indeed the result with the others dropping slightly further behind, but all credit must be given to Miss Boyes for her really fine show in finishing second in her first national.” The report was written by Mrs T Montgomery, Chief Coach, SWAAA. 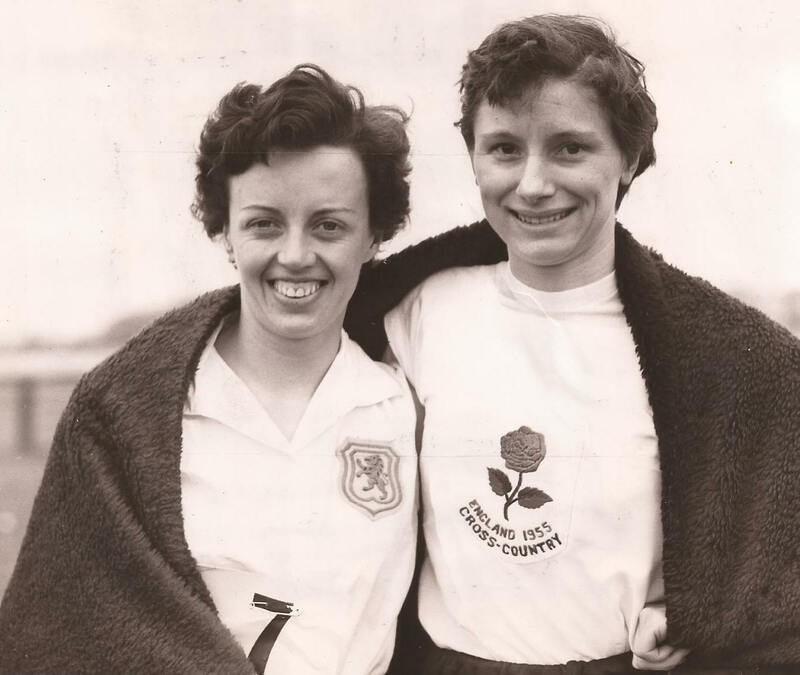 1956 started at with an open cross-country race at Ayr where Aileen was third in 15:52, exactly a minute behind the winner, Doreen Fulton of Springburn, with Molly Ferguson of Springburn second. Aileen was defending her national cross-country championship title at Musselburgh in March and she won again, this time from Doreen Fulton and JC Herman of Edinburgh Harriers. However one report of the race said: “Aileen Drummond will not run for Scotland but Mrs A Lusk has kindly obliged and stepped into her place. After a hectic weekend, Aileen was married to Mr Hugh Lusk in St John’s Renfield Church.” In the international, also held at Musselburgh, England took the first six places with Diane Leather being the individual winner for the third successive year. The above announcement after the Scottish championship was probably the reason for Aileen only finishing second in the SWAAA mile and not defending her half-mile title in 1956. 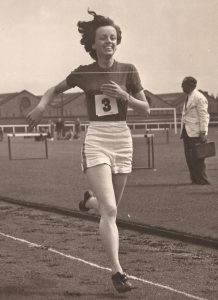 The Mile was won by up-and-coming Barbara Tait from Edinburgh who would go on to win the title five times and lower the record four times. “One of our foremost middle distance runners – Aileen Drummond of Maryhill Harriers – has decided to retire from competition. Aileen gave us our first taste of things to come by winning the SWAAA Mile title in 1953with a new Scottisg record of 5:35 and finishing second in the half-mile. 1954 – another year of success. She gained her first cross-country title and run for Scotland in the subsequent international against England at Birmingham, in June she completed her hat-trick of Scottish titles by taking the 880 yards in 2:25.4 and the Mile in 5:39. In this year too she ran her fastest ever mile to finish third in the WAAA championships in 5:12.9 – the fourth fastest mile in Britain that year. 1955 – another year of triumph and national titles. She retained her cross-country title over two and a half miles at Ayr in 18:39 and again ran in the international. Although not as fit as she might have been in the summer, she once more dominated the scene taking the 880 yards in 2:30.8 and the Mile in 5:42.3. 1956 – the year of the fallen idol? She she began well enough by retaining hercross-country title at Musselburgh for the third year in a very fast 16:26 and was once again the first Scot home in the international in Essex. Then came the national track championships and her last championships. In the mile she lost both her title and her national record to the young and promising Barbara Tait of Edinburgh Harriers who won in the new record of 5:28.2. In the 880 yards she had to concede her title to the much fitter, and this year the much faster, Molly Ferguson (Springburn Harriers). What a tribute from Dale, one who had so many battles with Aileen on the track and over the country. It had been a marvellous four years for Aileenas can be seen from the table below. And, of course, we have to add in all the international cross-country fixtures and invitation track races that she participated in. Given the few competition opportunities, unsophisticated training and generally poor surfaces on which to run, Aileen would have been a top runner in any generation. Aileen stopped running when her children were born and she spent time at home – but she says that she never really stopped running. The retirement from competition seemed to last for about ten years before she resurfaced in sports reports in March 1965. The season started with the usual races – 11th January SCCU Open Road Race; 23rd January Maryhill Harriers race in Glasgow; 6th February Open Races in Kilmarnock; and the National Championships on 22nd February. She was never in the published results that season, mainly because they only went as far as the top three finishers, and at time only the winner was noted. But she must have been running well because on 8th March she was eighth in the Glasgow v the Rest of Scotland cross-country race which took place at Fernieside in Edinburgh. By this time too Aileen had joined Western AAC, a new club formed by her old coach at Maryhill Harriers, Tom Williamson. She ran in this inaugural event and finished fourth and ran it again in 1977 when she was third. It is impossible to record all her races as a veteran but we can list those we do know in the following table. The above table gives an overview of her running as a veteran and gives an overview of her running as a veteran and and an indication of the distances involved, from the 5000m to the full marathon distance, from genuine home races such as the Vets Christmas Handicap at Bishopbriggs to to world championships in Berlin and Perpignan. Like many veteran runners the range is vast and we need to look at some of the races in more detail, and maybe have a look at some not mentioned above. 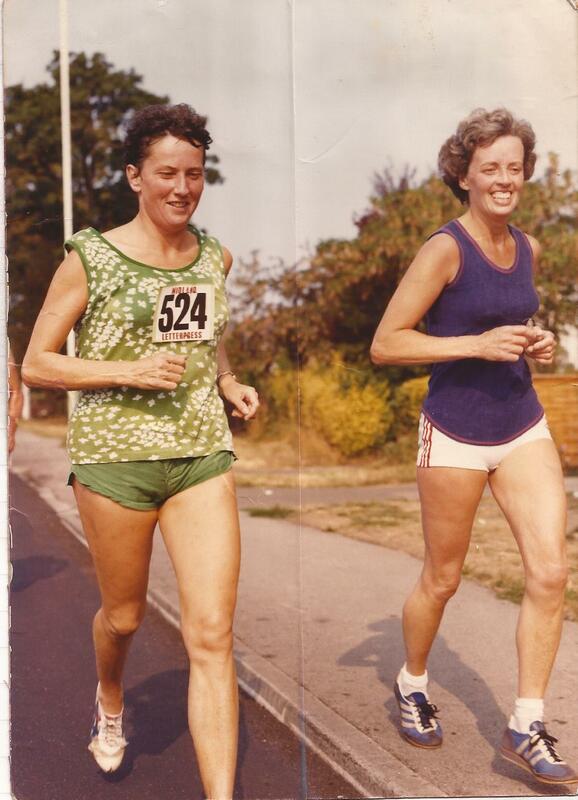 In 1976 Aileen travelled to the Vets 10K Road Race at Coventry and finished second; third in Berlin in 1978 and third again in the IGAL 10000m in Glasgow in 1980. It needs to be borne in mind though that although we are talking of veteran runners who are running for the enoyment of it, we are also speaking of runners many of whom had been winners many times over in their day and who are still very competitive. These races are no walks in the park! Every place has to be fought for and won. How did an 880 yards champion get into long distance road racing? 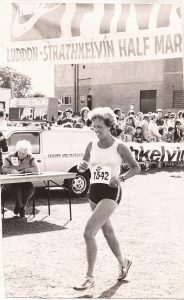 Aileen said that she uded to run with Dale Greig on Thursday nights in Bellahouston Park and it was Dale who encouraged her into vets racing and trying the marathon =- the first was at Inverclyde where she suffered badly on a very hot dayin 1981 but she managed to finish first in her class. In addition to the big championships and international galas, she took part in what she called ‘ordinary’ races as well – note the half marathons, vets events and Christmas handicaps above. Attention should also be drawn to her excellent run in the first of the 10K-OK women only races in Glasgow. The first race had 720 finishers and Aileen was twentieth, finishing in very good company indeed. Have a look at the top finishers in the race where Aileen was just behind international runners like Sandra Branney and Elspeth Turner. and then came 10 Anne Tait, 11 Caroline Miller, 12 Kate Chapman, 13 Gail Noble, 14 Mairead Christie, 15 Sally Johnstone, 16 Helen Oliver, 17Sandra Branney, 18 Elspeth Turner, 19 Nicole Garmery and 20 Aileen Lusk. Staying in Bishopbriggs as she did, Aileen was fortunate that one of the biggest and best sponsored half marathons of the 1980s was rght on her doorstep. The Luddon Strathkelvin Half Marathon started and finished in Kirkintilloch. 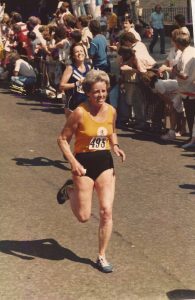 She competed in 1985 and 1987: in 1985 she was presented with the Grandstand Sports Trophy for her run which reslted in her best time of 1:44, and in 1987 she received a Caithness Glass Bowl for the woman veteran who had put up the most meritorious performance in the race. David Morrison of Shettleston received the men’s award. 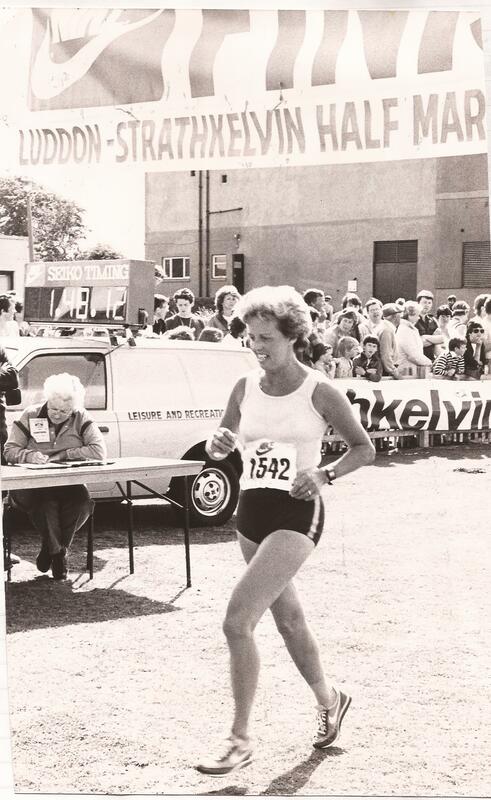 As well as runnin g herself in the 1980’s, she helped Molly Wilmoth with the organisation of the new Strathkelvin Ladies AC to cater for the girls of the district. It was a successful club and their energy and keenness made it so. 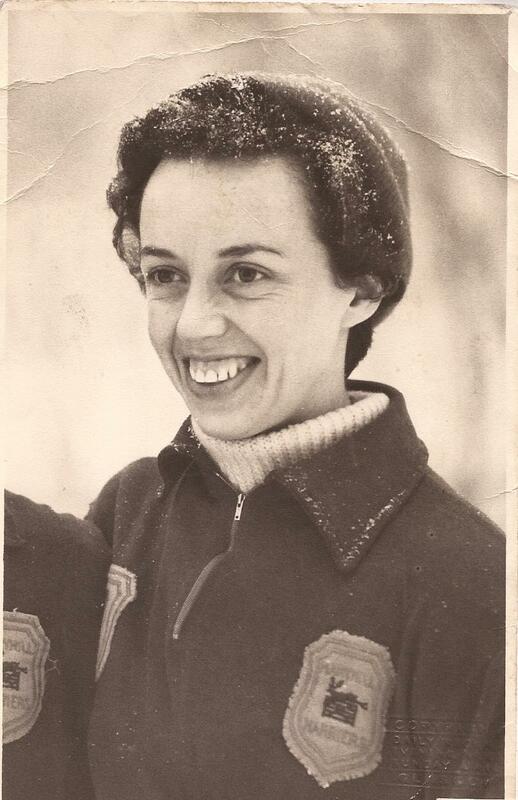 Aileen had a very good career in the sport, almost all of it as a competitor, she was never noted as an official or administrator. I don’t know if she ever owned or wore a blazer but her ability and desire to compete never went away. She came through from the start of the 50’s to the late 80’s, she saw many changes in the sport and achieved a lot. Note the following changes. * The national championships on the track changed greatly: there were only 14 events in a women’s only event when she started to 39 in 1960 and even more today. *More long distance races were introduced to track programmes. * There are now more open races for women throughout the year. *The return of international matches on the track – some women only, some for both men and women. All of these make it easier for succeeding generations of woman endurance runners to succeed than it was for Aileen, Molly and Dale. Her own career has been documented here, but the question is – what could Aileen and her contemporaries have done had their career started in the mid-70’s with better tracks, more sophisticated training methods, medical and physiological back up and so on? One of her contemporaries is sure that she would have represented Britain and been an Olympian. However that may be, she had a wonderful sporting career and is happy with what she achieved. The only possible regret is maybe that it finished after a car accident when training from home. Aileen is a onderful example to any athlete.